Surviving Suburbia, a no-go for the CW network, has resurfaced to claim a plum spot on ABC's spring schedule. The Bob Saget sitcom will premiere on April 6th following Monday night editions of Dancing with the Stars, ABC announced Wednesday. 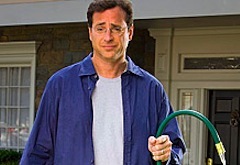 Surviving Suburbia, in which Saget plays a cynical husband and father of two children, originally was tabbed for CW's outsourced Sunday night schedule as part of an arrangement with Media Rights Capital. But CW dissolved the relationship with MRC before Surviving Suburbia could premiere. 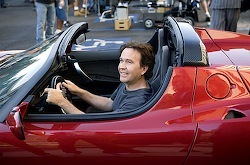 ***TNT has picked up a second season of Leverage, a Mission Impossible-ish action drama starring Timothy Hutton. The series premiered in early December and continues to air on Tuesdays at 9 p.m. (central). ***The CW will be returning Reaper to its schedule earlier than announced. Its second season, 13-episode premiere now is set for Tuesday, March 3rd at 7 p.m. (central), with 90210 pushed back an hour to 8 p.m. on that night. The first-year series Privileged will have its "season finale" -- and possibly series finale -- on Feb. 24th at 8 p.m.